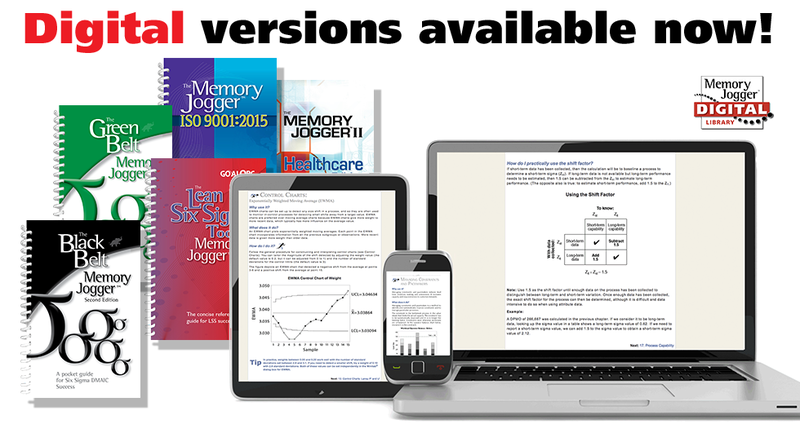 Now you can have all of your Memory Joggers available at your fingertips, all the time, with the new digital Memory Jogger Library! The Memory Jogger Library contains digital versions of your favorite Memory Joggers with new titles and updates added regularly. The digital Memory Joggers are always the latest editions and versions of each book so you can be sure you are reading the most up to date content. Accessing your books online is easy! With just a few clicks you can read through chapters, or jump right to the tool you are looking for with ease. You can also easily resize the text or graphics to suit your viewing style. The Memory Jogger Library is internet based and can be accessed by any device with a modern browser. Access your favorite Memory Joggers from your phone, tablet, and computer, regardless of operating system, whenever and wherever you want, as long as you have internet access. Reading your favorite Memory Jogger in any language has also gotten a lot easier with the Memory Jogger Library. Now with the help of standard apps and extensions built into modern browsers such as Chrome, Edge, and Safari, you can easily read the text of your Memory Jogger in your preferred language. Memory Jogger Library licenses can be purchased for individual books or for the entire online collection. Upon joining the Memory Jogger Library you can preview samples of the other titles we have available and easily purchase access to new Memory Joggers, all online. Never be without your Memory Joggers again!